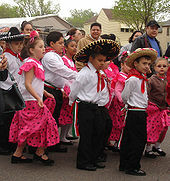 You are at:Home»Lifestyle»Food»May 5, 1862: What is Cinco de Mayo? May 5, 1862: What is Cinco de Mayo? On May 5, 1862, the Mexican Army defeated the French Army at the Battle of the Puebla (Puebla City) during the Second French Intervention in Mexico, a marvelous victory for the Mexicans over a superior French force, a victory celebrated each year on May 5th, or in Español, Cinco de Mayo. Oddly enough, the Mexican celebration has been appropriated by Americans in the United States where it has become a bigger holiday for us Gringos than for Mexicans! Mexico had been torn by one of their seemingly eternal civil wars which impoverished the country and force Mexico to renege on their foreign debts. European countries took umbrage at the Mexican inability to pay, and formed an alliance among British, Spanish and French forces called the Tripartite Alliance. All three European nations sent armed invaders to Mexico in January of 1862, but the Spanish and British armies withdrew when it became apparent the French wanted a more aggressive war than merely recouping debts. It seems French Emperor Napoleon III wanted to establish Mexico as a vassal French state. A Mexican force of 4500 men led by Ignacio Zaragoza and Benito Juarez marched on a French occupying force of 6500 men. The French had already agreed to evacuate, but the Mexicans mistook their movement of troops as a hostile act and confronted the larger force. The arrogant French commander was irked by Mexican audacity, and instead of completing his evacuation, he had his men occupy Orizaba. Skirmishes resulted in Mexican defeats, so Zaragoza retreated to Puebla to regroup. The French commander, Charles Lorencez thought the civilians at Puebla were pro-French, and attacked the Mexicans. The Mexicans counterattacked the French after the failed French attack, winning a resounding victory for Mexico. The French lost 476 men killed and another 304 wounded, while the Mexican force lost only 87 killed and 131 wounded. Lorencez regrouped his forces, but Zaragoza did not resume the attack, so the French withdrew back to Orizaba. Unfortunately for Mexico, France sent more troops and eventually did establish European dominion over Mexico, which only lasted until 1867. While Mexicans celebrate their victory over the forces of a great power, it is Americans that really celebrate on Cinco de Mayo. All across the US people gather at picnics and Mexican restaurants and bars with Mexican themed food and drink, guzzling Corona, Dos Equis, Modelo, and every other available Mexican beer and tequila. Nachos (not even really a Mexican food) and tacos are gobbled with glee, or at least by this author’s family! Alba, Victor. Mexico: A History. New Word City, 2017. Chavez, Ed. The Cry of Gloriana: At the Battle of Puebla on the Cinco de Mayo. CreateSpace, 2012. Horner, TC. Cinco de Mayo: Why a Mexican Military Victory Became an American Cultural Celebration. CreateSpace, 2014. Next Article May 6, 2018: Marvel’s Infinity War; What if Thanos’s Plan Came to Pass?